Shipping containers are looking more and more viable for the small house and small living movement. Yearly, millions of shipping containers arrive in U.S. ports, but only a portion of these containers ever leave our consumptive shores. For many companies, the cost of shipping empty containers back across seas for reuse exceeds that of purchasing new ones. Add to that our negative balance of trade, and empty containers start piling up. Although the problem remains formidable, out of the box thinkers are coming up with great ways to make use of the hundreds of thousands of containers that are literally stacking up around the world. As it turns out, with a little spiffing-up, shipping containers are ideal building blocks for prefab homes, and their reuse can provide answers to environmental and social problems alike. In London, Container City™ has constructed a jigsaw-like apartment complex of converted shipping containers. Check out the video below for the full scoop on these chic, recycled homes. Container City™ now has more than 20 projects in the works. Shipping containers have also been converted into student dorms. In Amsterdam, 1000 students enjoy dormitory units complete with private bathrooms, kitchens, balconies, and high-speed internet access. 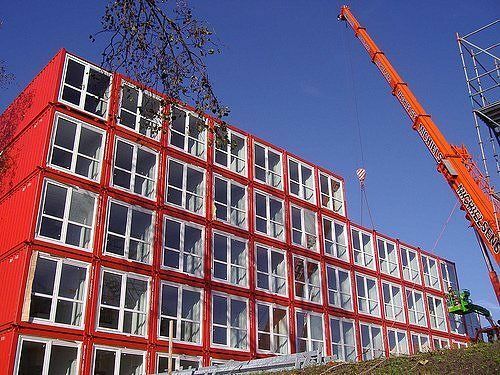 Dubbed “Keetwonen,” the dormitory in Amsterdam stands as the largest shipping container “community” to date. And in Mexico, PFNC Global Communities (“Por Fin Nuestra Casa” – translated, “finally, a home of our own”) converts surplus shipping containers into affordable housing for low-income families in Juárez and Tijuana. The social mission, as PFNC defines it, is to “to raise the standard of living for families who currently reside in dangerous or substandard conditions.” PFNC purchases surplus containers from the United States and converts them to livable living units with low-cost, recycled materials. Check out PFNC’s website for more information on the projects underway and on PFNC’s recognition in the world of business social responsibility. And finally, for all of you interested in constructing your own shipping container home, these folks have put together a Shipping Container Housing Guide to satisfy all your shipping-container-related questions. Check out WebUrbanist’s guide: Buying, Designing and Building Cargo Container Homes as well. Via Tempohousing and PFNC Global Communities. – Respect the structure of the container, don’t cut side rails, top rails, or corner posts. – Keep all the loads going down the corners. – Keep the design simple, adventurous designs will look good but ruin the structural efficiency of the containers and raise the costs unbelievably. – Repetitive is good, try build larger buildings in modules of the same type. Finally, in an answer to the question I keep getting by e-mail – you can not bury shipping containers for underground structures. What are the reasons for not being able bury a shipping container other than rust? I’m imagining they are structural issues. Anyone care to chime in? In burying a container, it will not take the soil pressures at the sides – the pressure is too great. You will have pressures on the order of 320 LBS/SF on the walls at the base of the container, which it is not designed to handle. Concrete is better for such a use. Sounds great Tom! We are not experts but you’ll find them via the links in the post. We’d love to see your sketch! Send it to editor (at) smallhousestyle.com and we’ll update the post! Wow. Would love to see it. Did you find it on the internet? – Did they take into account the loads on the sides? A pool full of water will counterbalance the soil, but I don’t that’s quite kosher with Code, since the pool could go empty for a long period of time. – What about corrosion? Chlorinated water is horribly corrosive, and so is soil. I wonder how long this would last before rusting away, even with a good coating. None the less, I’d like to see it. Personally, I will probably continue to refuse to design buried containers, but still I’m curious. I’ve checked out a lot of websites about shipping container homes, and most are full of hype and little substance. What’s interesting is almost all of them have very pretty renderings, but no photos of jobs they have done. Many that do have photos are of jobs that they had nothing to do with. I see the house we designed in Atlanta on sites all over, with no credit give to us, the architect, or the builder. Please take the hype with a grain of salt, shipping container houses are fine, many websites make you think you can build one for next to nothing, and they go up by themselves. That is not true. Container buildings are a fascinating part of modern architecture. Maybe even of future Architecture.